NOTE: There are many ways in which you can find a client record in NutriAdmin. This is useful, specially when you have a large client base that has been growing over time. Step 2: If you know the name or email of your client, you can type his/her name or email in the Search box above the clients table to instantly find the record. Step 3: If you remember the approximate date when you created the client record, you can click on Date Added on the header of the table. 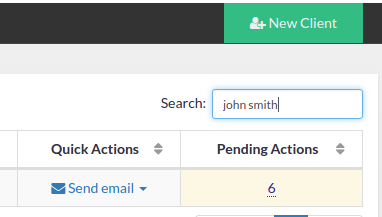 This will sort records by date, which will help you find the client you are looking for. NOTE: You can also sort by Name or Email to make it easier to find the person you are searching. You should take into account that by default NutriAdmin will show you 25 client records at the same time in the screen. This is for clarity, as a very long table would be harder to manage. You can change the number of records shown in the screen by clicking the button on the top-left of the table. Alternatively, you can navigate between different parts of the table by using the buttons on the bottom-right corner of the screen. That's it. 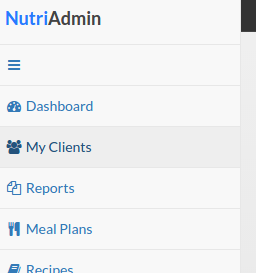 Finding clients is easy in NutriAdmin. The database is automatically organized for you at all times.